We are Move With Grace dance studios and we believe that Dance helps kids reach their full potential, build confidence and inspires pride! Watching your child shine with joy while learning dance is as rewarding for you as it is for them! Our dance studios are named the best dance school not only in the city of Cambridge, but also in the Region of Waterloo for a third year! read about 2016 award , 2017-2018 award. 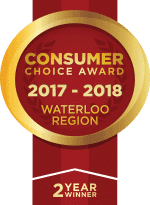 We can confidently boast this as the winners of the 2016 & 2017 Consumers Choice Awards for Waterloo Region in the category of - Best Dance Studio. "The Consumers’ Choice Award is unique in that winners are not chosen by a panel of judges but by consumers themselves. Recipients of the CCA represent “Best in Class Businesses” in the quality of their service, value, professionalism and integrity. 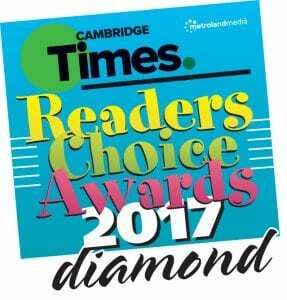 Identified winners ..."
The Cambridge Times Readers Choice Awards have also awarded Move With Grace Dance Studios the 1st Place Diamond Award - Best Dance School for 13 years since our formation back in 2004. This is voted on by Cambridge Times readers and selected by the community, which is very humbling and we thank you! 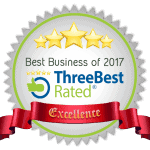 We have also been recognized by Three Best Rated - Best Business of 2017. Why is Move With Grace Recognized as the Leader in Quality Dance and Performing Arts Education? Because we build confidence in kids through dance and the performing arts in a fun family environment giving them a sense of belonging purpose and pride! We do it in a unique way - we treat the students with positivity & respect. Our faculty are the best in the area, highly qualified to teach and wonderful with kids. Our faculty are exceptional dance teachers, recognized leaders in the industry. Miss Robyn was asked to be the Canadian Judge in the 2017 Commonwealth Cup of Dance in Sun City South Africa this year. She is a IDO Choreographer. Move With Grace is a Team Canada Tap training facility for 2017 as well under the direction of Mr. Matthew Clark. Move With Grace provides dance classes for children ages 2 to 18 in Cambridge, Ontario. Because our studios are located in a regional area we have many clients from Kitchener, Waterloo, Guelph, Puslinch, and Wellington counties as well as the Region of Waterloo. Teachers, the process, the class, the student - all can be observed at all times. Our present facility in Cambridge is 10,000 sqft including a 2500 sqft. wireless internet cafe for the parents. All of our classes are broadcast onto large screen TV's. You are welcome to stay! We have 5 large air conditioned studios with sprung professional dance flooring surface to minimize potential injury. Payments may be made either by personal check, cash, Debit Card, Visa or Mastercard. Checks should be made payable to Move with Grace Inc. To ensure proper credit, please put your child's name on the check, especially if your child has a different last name than yours. You may also pay online anytime through your parent portal by credit or debit or by enrolling in automated payment. A $25.00 processing fee will be added for all returned checks. The studio reserves the right to discontinue a dancer's classes for non-payment of tuition and fees when necessary. Past Due: Parents or students who allow their account to go into arrears may forfeit their place in class and in the recital. If a circumstance should arises where a payment will not be made at an agreed time it is incumbent upon the client to inform Move With Grace Inc. immediately to make alternative arrangements. Tuition payments Past Due are subject to a penalty of 2.5% per month. Accounts failing to pay under the terms of our policies and registration contract without previous arrangements, will be subject to collections activities. The studio requires written notice to the front desk at least 4 weeks prior to discontinuing classes. You will be responsible for four weeks tuition from the date the studio receives notification prior to October 15th. Withdrawals after October15th are non refundable as the class spot cannot be filled or replaced after that date. Registered students are responsible for the full term tuition past October 15th. For registrants after October 15th, no drop add period exists however if you are leaving for any reason, we would appreciate four weeks written notice. Students are responsible for letting the instructor know if they will not be returning to a class. If a student is not enjoying a class in which they are registered and would like to move to an alternate class spot in a different discipline, we will make every effort to make that transition for you. All tuition payments are due by the 5th of each month if a special payment schedule is arranged prior to class start. Post dated cheques are due before the first scheduled class. Payments may be made in three term sections of September, December and March or monthly from September to June but will be subject to a 12% interest adjustment. Payments remain the same each month regardless of attendance, school closures, holidays, etc. 7. Grace: "It is not just to Dance…it is to Move With Grace" We believe there is grace in everyone, not only in movement but in mind and spirit. We will be graceful in our approach, our doing and our outcome. Move With Grace Dance Studios supports a vision of "Building Character in People Through Quality Dance Training." Please call 519-650-5633 for more information while we are updating our website.